riches and the spoils of war are loaded on to the deck of the ship. We found them along the riverbank, Captain. have a burning desire to see Egypt. Have you finished the map? Good work. But this is wrong. this. Here, let me show you. You took us from Nubia...and now you say we belong to you, yes? to me. Now let them go. Throw her in the River. No, I have a better plan for her. 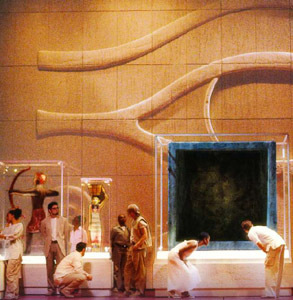 RADAMES leads AIDA off as the set rises to reveal the ship's lower quarters. Once in his quarters, RADAMES lifts his hand. AIDA covers her face. You don't want me to remove your shackles? in my army. Make you my Lieutenant. Are you mocking me, Captain? It's been a long time since I've felt clean. You're much better with a sword than you are with a sponge. I wish I had a sword now. There's mine. Help yourself. Who taught you to use a weapon? Because he knows that Nubian men can't protect their women? You enjoy living dangerous, don't you? Captain, we're ready to dock! You're a slave now! And if you want to survive you better remember it. unloading the ship and securing the slaves. A MERCHANT enters, carrying gold. Mereb, Mereb...Is that the wine? Master, I am so glad you've returned. Have you kept my house in order? Yes, well except for a few casks of wine, which have mysteriously disappeared. Here you are my son, home at last! Step aside Mereb! Yes, oh Chief Minister Zoser... loved by the Gods, the people and himself. It's good to see you father. I kept telling the princess that no man could best you with a sword. Listen, beyond the fifth cataract the Nile heads directly toward Khartoum. Then we can attack the city by water? Excellent! You recorded the landscape? seem to keep them alive down there. I need a gift for the princess. Yes. She'll be expecting something. Take the others to the Palace Groundskeeper. They can help with the harvest. They're all women. They wouldn't last a day underground. As you wish. They're your slaves. Give me your hands, Aida. I'll make an exception for you. Mereb, take her to Princess Amneris with my compliments. You've been gone six months. I really think a personal appearance is in order. my crew is rested, I am setting out again. he was when you left. You mean Pharaoh has fallen ill? Is it serious? Someone has been telling Pharaoh about our private meetings. Traitor! He's become a liability. Who would have thought the copper mines would yield such an abundant supply? Put some in Pharaoh's wine tonight at the banquet. Again, only a few drops. We don't want him dying...just yet. AIDA appears in a uniform of a Palace Slave. What that man sees and understands could be etched on a grain of sand. That was surprising and decent of him. guard. He promised he'd look after me from then on. He has kept his promise. still Nubian. I will always be Nubian. They would kill you. But our people will keep your secret. from an Egyptian captain to his Princess. Just so you know, Amneris is more than that to Radames. She's his betrothed. He's to be married? When? The day his ship sinks and the royal builders refuse to make him another. Come; let's get you to the Princess. Steam begins to fill the stage. WOMEN OF THE PALACE enter wrapped in sheets. It is such hard work maintaining perfection. But worth the effort, don't you think? Oh, yes. Definitely worth it! You're perfect. the man destined to be my one and only, is neglecting me? Would it please you if I were? Then I am doing as you please. What do you know of the captain? I did. You see I've been so...You're very astute, aren't you, Aida? secret that was passed down by the handmaidens of Queen Neferteti. really, really knows me. Go, Mereb, show Aida the sewing room. All right ladies, let's polish this gem. Mereb, was the Princess please with my gift? Yes. Aida managed to make herself indispensable in record time. No! Nothing! She said nothing. Is this the latest fashion? It is now. So your expedition went well? Really? That sounds very... scenic. Maybe next time I'll go with you. and this time the water was so tainted we vomited for days. Whew! Then again, I'm pretty busy. Princess, the word of your arrival has spread through the Nubian camps. Your people cannot wait to see you. Welcome, welcome. Okay, so I told one person. Maybe two. Princess, your people need to know. What ever you think is best, father. It has been my privilege to serve you, Your Majesty. years now. Long enough, I'd say. I want to see her and our nation happily settled before I leave this world. Amneris. The Son of Isis has spoken. into such a stunning young woman, I would have offered for her myself. I thought you loved Amneris? Of course I do. We grew up together. ruin it - not for yourself, or me! Welcome to your new life, son. ...near the Second Cataract. The river's an entirely different color there. No, it's an entirely different color here. to see something on the shore. Did you ever sail north? was too...Was too dangerous a place to take me. harsh. But there it shimmers. It's the most beautiful place I've ever seen. Of course, it's Nubia. I would like to see that part of my country. Are you talking about Nubia now? I will take you sailing. South, you can be my guide. Would you let me steer? Would you run us aground? behave like a good...to behave. You talk as though you've been enslaved. Not with chains, maybe, but with a marriage promise. the Pharaoh's throne. It is a great tragedy. understanding from this humble palace slave. Stop! I command you to stop! But why did I tell her this? AMNERIS sits at her dressing stand, brushing her hair, forcibly. AIDA enters. it was a magnificent feast, though, wasn't it? Oh, you have no idea. The responsibilities are... overwhelming. Your people must expect so much. No, stay. Pour the princess a cup of wine. Are you trying to get me drunk, Radames? You know it's not necessary. Is that your bed in there? Silk covered and fat with feathers. Why don't you go in and I'll join you in a moment. Radames, are you sure? We're going to be married in a week. Amneris, we've been engaged nine years. away? You forget that I can have you carried off to the copper mines. And you forget that I am her property now, not yours. It doesn't matter. Because I know now that you were right. I'll be right in princess. Radames, your engagement party is waiting. You should go to her. Were you a noblewoman before you were captured? What does it matter? There's nothing noble about me now. Yes, we mustn't ever forget that I'm a slave. speak... and now you're stalling. Why? female body, Captain. Maybe then you'll be more inclined to come explore. well. Now he's a mystery to me. the middle of the stage as MEREB approaches her. Aida, there you are. Will you come with me? The Nubian camp. Look, everybody knows that I'm the one who can get things. And our people... They've have asked me to bring them... you. of her own selfish pleasures. Aida, the Nubians want their princess. You were watching me again. All week your eyes have been on me. my attention? You are beautiful, but I am not so easily led. I have no chalice now... and yet you're looking. Excuse me, Captain, but I have linen to wash. I do not excuse you. Stop there. You wanted something from me? while my countrymen are dying. You want my "affection," captain? you feel anything for me - aside from contempt. and yet...Aida, I must make things right with him. That love could be so good? Nehebka, where did you get that? another basket handing out fruit. other night must be gone. But you stay, Aida. Apologize for me. You can. You always say the right thing. I never do. No princess, please don't make me. I would never make you. But I am asking you, as my friend. It was nothing. Actually, it was everything, but it doesn't matter. You are betrothed to my mistress! It was arranged by my father, and it will be unarranged by me. why you bothered to do this. You could have at least kept a blanket. be a new man for you, Aida. Cleansed of my past sins. to the palace. You'll be safe there. But we have captured the Nubian King! this. I'll see they receive the highest honors. Tell the others I'm on my way. Aida, our countries are at war. I can't change that. But he's my...He's my king. She leaves him. RADAMES realizes what he's done - and hates himself for it. Princess - say it's not true! I saw our king dragged through the streets with my own eyes. I heard they've already executed him. And they are carrying his head through the street on the end of a spike. Amonasro of Nubia is alive. I saw him taken to the prison. But it's only a matter of time before the Egyptians slaughter him. we have no hope. When the king dies - so does Nubia. native soil, Nubia lives in our hearts. And therefore, it lives. The spirit always burning though the flesh is torn apart. places. The laser forms the triangle around them. In my passion and my haste? Am I leader? Am I traitor? Did I take a step too far? Did I take a step too far! is this how the gods reward the faithful through the ages ? ZOSER is showing AMNERIS a giant map of the Nile. But why did we invade Babylon? Perhaps, Princess. But where do you think that beautiful necklace came from? I've been explaining our foreign campaigns to Amneris. Yes. Because she wanted to know what's been preoccupying you of late. Nubia. I miss you. Can't we spend this afternoon together? Here, you can read this while you wait. It will give us something to talk about. That was clever of you. I can't have you neglecting the girl. Not after all the trouble I've gone to. I haven't asked you to do anything for me! hours with that slave girl. Oh, your spies are good. Radames, you can have your little diversion, just wait until after you've wed. Your mother never had any complaints. She never had any choice. Don't you realize that whore could cost you the throne? Do you really want to throw away your future? All for some wretched slave! In a few months, you won't even be able to remember her name! You can forget about your plans, father. There will be no wedding! He's lost all sense of reason, and why? Once we rid him of this blight. Once this harlot's out of sight. Then I think he'll see the light. He won't walk back to daddy he will run. Find the slave girl called Aida. And when you do...kill her. Tomorrow Princess, you and your father will be free! We will live to tell our grandchildren of the King's great escape! We are here for Aida. Which one is she? risk their life for Nubia. You're going to meet him, aren't you? us already. You are our Princess, our inspiration, our promise of a new day. They came for me. But they took another. I blame myself. of our countries. And we will sail the Nile. No! You can't. You can't call of the wedding! Yes, I can. And I will. you want for us is impossible. They would hunt us down. It is a foolish plan. I will find a way for us to be together. to do something important. Don't you see? It may be the whole reason we met. Then it would be a cruel trick! Not if the Gods put us together for some greater purpose. two. She exits in the opposite direction. AMNERIS emerges from the shadows. How did I slip and fall? Without any thought at all? It's flown just a little too far. Why do I want him still? Why when there's nothing there? as numb and duty bound. The PHARAOH, sicker than ever, presides. your lives be filled forever with the joy of this moment. Your majesty, the Nubian King has escaped! Radames, call your men to arms. Fan out across the city! The fastest route to Nubia is by water. Send a regiment to search the docks. No! Seal off the docks! No one must reach the pier before I arrive there. Princess, we must hurry. They've sounded the alarm. Forgive me Father, but I need one last moment with him. could not act selfishly now. So you lied to me? Not when I said I love you. Say you believe me. Aida, get in the boat! This is your last chance. Radames! For the love of Egypt stop them! Radames! What have you done? It's all over, Father. When they come for me, they'll take you away too. Forgive me, Princess. I failed you. No...never! You, Mereb, inspired me. I wanted to go back to Nubia. Aida, take me home. Amneris. I never meant to hurt you. life. Listen to me, they want to bury you alive. Yes. That's what we do to traitors. been wrong, except for this. Take your hands off her! After all, she is a Princess. No wonder you understood me so well. Radames. Please, let him live. Amneris let him live. Yes, you can. You love him! Don't you love him? Amneris let us begin. Bring forth the prisoners. you. I trusted your father. Now I will make things right while I still can. The criminals will receive their sentences! Father, I have a request. would ask...that the prisoners be allowed to die together. But that would be mercy - after they disgraced you before the entire nation. I was wronged. It should be my decision. You don't know your own mind. one tomb...together. The Daughter of Isis has spoken. The tomb comes forward. GUARDS force AIDA and RADAMES into the tomb. every bend in the Nile. Just waiting to be discovered. You will find me in that world? If I have to search for a hundred life times, I will find you again, Aida. the Prologue ... PHARAOH OF EGYPT. AMNERIS sings. circle the model of the tomb. Yes, they know this place. They look up.